GCU Dance team members pose with their national championship trophy from the Game Day competition. 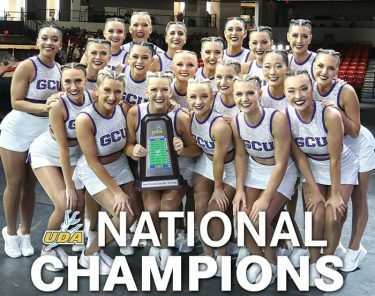 The Game Day atmosphere that Grand Canyon University’s spirit teams execute in sleek, enthusiastic fashion paid off Friday afternoon in the first national championship for a GCU Spirit team. 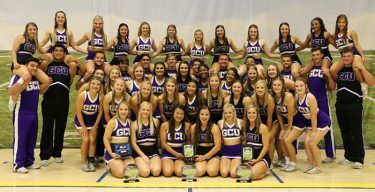 And a few hours after GCU’s Dance team won the Game Day Division I title, GCU’s Cheer team finished runner-up in Game Day Open Co-ed competition. 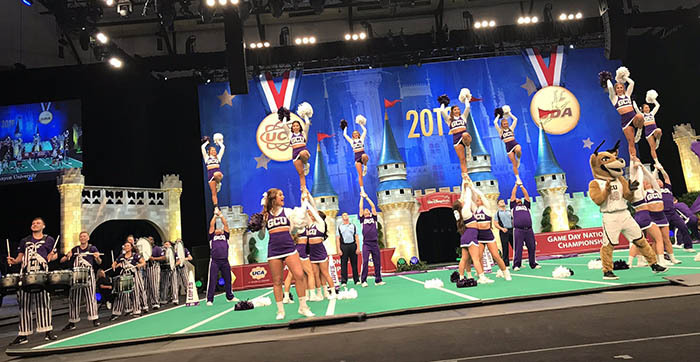 The Dance team, with Thunder and a seven-member drum line pitching in, captured the title in the Cheerleading and Dance Team National Championships at Orlando, Fla., conducted by the UCA (Universal Cheer Association) and UDA (Universal Dance Association) at the ESPN Wide World of Sports Complex. The University of Nebraska-Omaha placed second, followed by St. John’s University. The seven-person drum line (one snare, two tenor and four bass) was guided by Band Director Paul Koch. 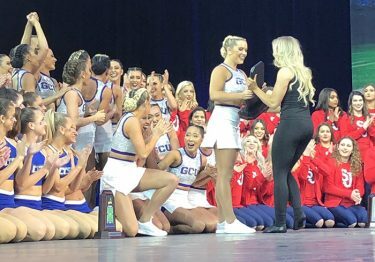 GCU is awarded the championship trophy for Division I Game Day at UDA nationals. 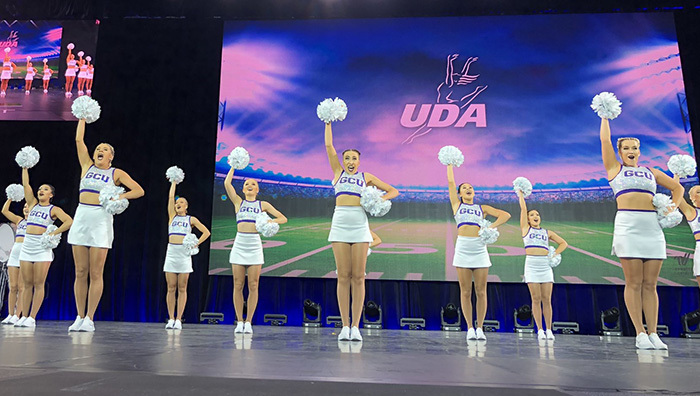 The same pregame, fight song and timeout performances that pump up the Havocs student cheering section and thrilled Lopes fans all year made a major impression on the judges. The Dance team, led by coach Jacque Genung-Koch, is also entered in Division I Jazz, scheduled for Saturday. The Cheer team, under the direction of Emily Stephens, Director of Spirit Programs, and associate coach Keegan Hubbard, finished behind the University of Delaware. Southeastern Louisiana University placed third. 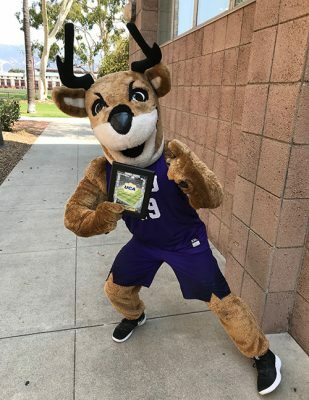 It was GCU’s first participation in the Game Day category, a second-year event. The fight song, timeout routine, chant into band dance and sideline routines of Game Day reflect the core priorities of the nationally recognized game day atmosphere under the direction of Helen Bleach, Vice President of Campus Events and Arena Operations. The Cheer team competed in Game Day with the band and Thunder. Those details include rallying and engaging a crowd. In terms of the jazz event, the dance team will compete in the Division I level for the second consecutive year following an impressive fourth-place finish in 2018. That routine is limited by rules to 15 dancers while 30 are permitted for Game Day, but Genung-Koch limited the travel squad to 20 because she wanted to have 12 dancers available to perform at the men’s basketball games this week. The Dance team is competing in two areas: Game Day and Jazz. Preparation for competition began last May after 32 dancers emerged from the tryout process. From that point until July, they worked out at home to maintain strength, cardiovascular conditioning and agility in preparation for team practices and camps from late July through the start of classes in late August. Since then, the dancers devote approximately 20 hours per week to rehearsal practices, strength and conditioning sessions and performances at athletic events and community appearances. The jazz routine is more technical this year, requiring an increased number of turn combinations, faster dancing and a higher cardiovascular level. The Cheer team, which also trains and performs approximately 20 hours per week, will compete in its second and final event on Saturday. The small Co-ed Division I category features a more traditional routine. It is performance-based, including extremely difficult stunts and tumbling. It consists of four males and 12 females and judges will expect the routine to be flawless to make it to finals. The unprecedented runner-up finish for the Cheer team fell in line with Stephens’ prediction. Before the flight to Florida, she said the Game Day performers would show the nation “what makes GCU so special.” The six men and 24 women who traveled to Florida performed nearly both routines at the women’s basketball game on Jan. 12. The Cheer team prepared for the season at an award-winning camp at UC Santa Barbara. Comparing his squad to basketball players shooting 100 3-pointers on their own, Hubbard said the extra preparation by each individual has accelerated the team’s performance level. 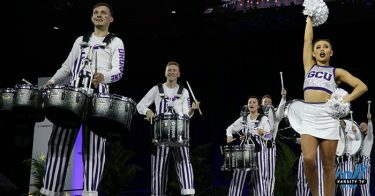 As with cheerleaders and dancers who pump up the crowd, Koch has worked to yield the most from each of his drummers – both inside and outside. That means high energy, smiling, laughing, dancing and playing up to the crowd. “It has been fun watching the kids work through that, growing and developing as performers making their performance chops match up with their musical chops,’’ Koch said. As a member of the PHX Percussion drum line for the Phoenix Suns in 2005 and their leader from 2006 to 2010, Koch knows exactly how to play to a crowd. Thunder is participating with the Dance Team and Cheer Team at nationals. In terms of nationals, the judges are even more important than the crowd. With one national title and a runner-up finish after Day 1, practice is making perfect.